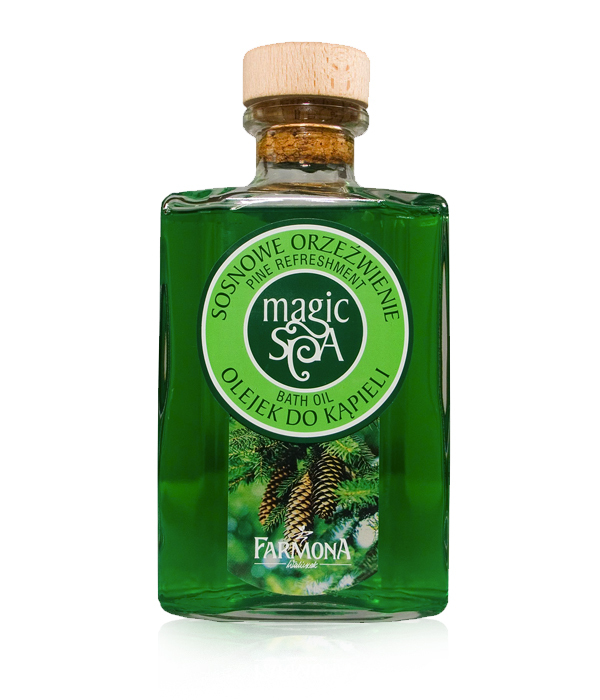 The bath oil with natural pine needles essential oil, wheat bran extract and the truly moisturizing Soft Skin complex. Due to the fresh scent of forest conifer needles it reminds one of the moments of carefree rest, gives energy and vigor and makes one optimistic. It stimulates, encourages increased activity and visibly improves the mood. The natural essential oil embraces us with a sensual scent: the muslin foam, nourishing wheat bran and the moisturizing complex leave the skin silky smooth, soft and delicate. Natural pine needles essential oil, wheat bran extract and Soft Skin complex. Aqua, Sodium Laureth Sulfate, Cocamidopropyl Betaine, PEG-7 Olive Oil, Cocamide DEA, C9-C11 Pareth-6, Sodium Chloride, Parfum, Brain Wheat Extract, Polysorbate-20, PEG-120 Methylglucose Dioleate, PEG-150 Pentaerythrityl Tetrastearate, Pinus Silvestris Oil, Panthenol, Citric Acid, DMDM Hydantoin, Methylisothiazolinone, Methylchloroisothiazolino ne, Limonene, Linalool, Citral, Eugenol, CI 19140, CI 42090.